Feast: Lunch on the Cheap | CookDrinkFeast! My job allows for a short lunch break. So short that even a trip to the company cafeteria eats up two-thirds of the time allotted for lunch. The upside of this is that I save lots of money by brown-bagging it every day. So when Food Network’s Healthy Eats blog issued a brown bag challenge for the month of September, I immediately jumped in. Often, I feel like grazing for lunch. 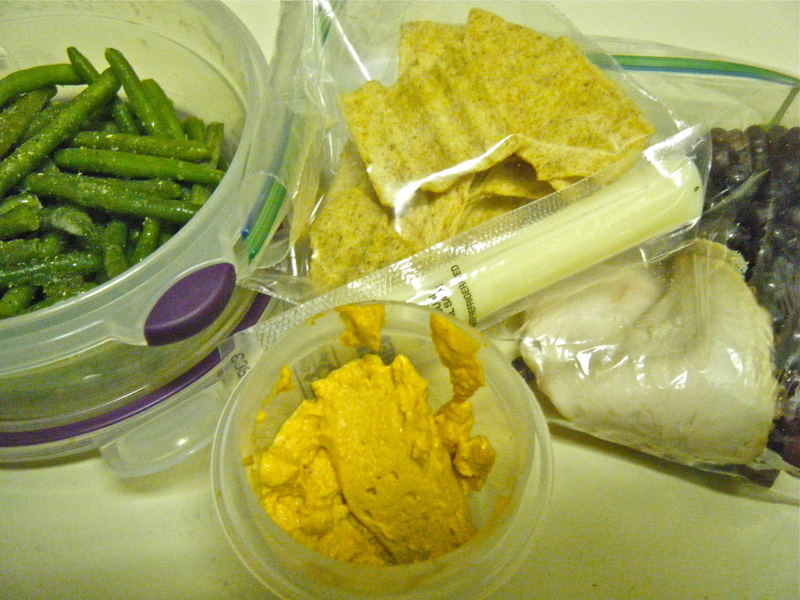 Haricot vert (French green beans), chipotle hummus, light string cheese, a couple of slices of roast turkey, multi-grain chips, and champagne grapes. Leftovers make a quick and satisfying lunch. 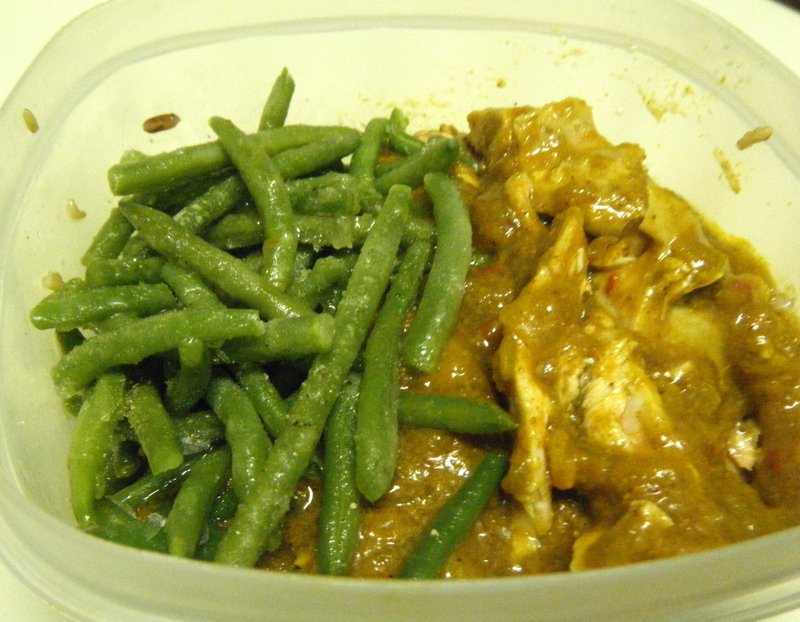 I made curried chicken for dinner the night before. I took the chicken off of the bone to make it easier to eat at my cubicle. I’ll post the recipe soon. Grazing for lunch again. 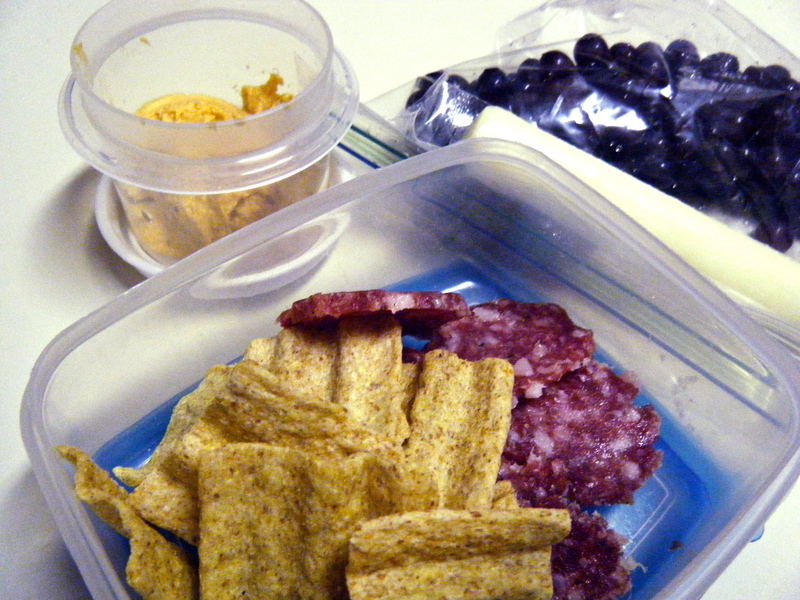 Champagne grapes (the teeny tiny grapes are so cute), chipotle hummus, sopressata, and light string cheese. I cleaned out the refrigerator for his one. 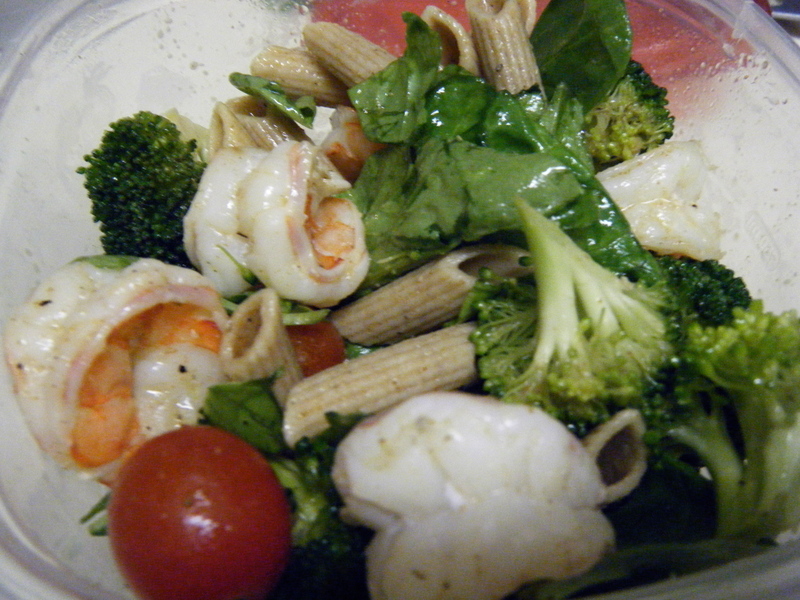 Whole wheat penne pasta, boiled shrimp, cherry tomatoes, broccoli, and spinach tossed in a vinaigrette. Leftovers again. 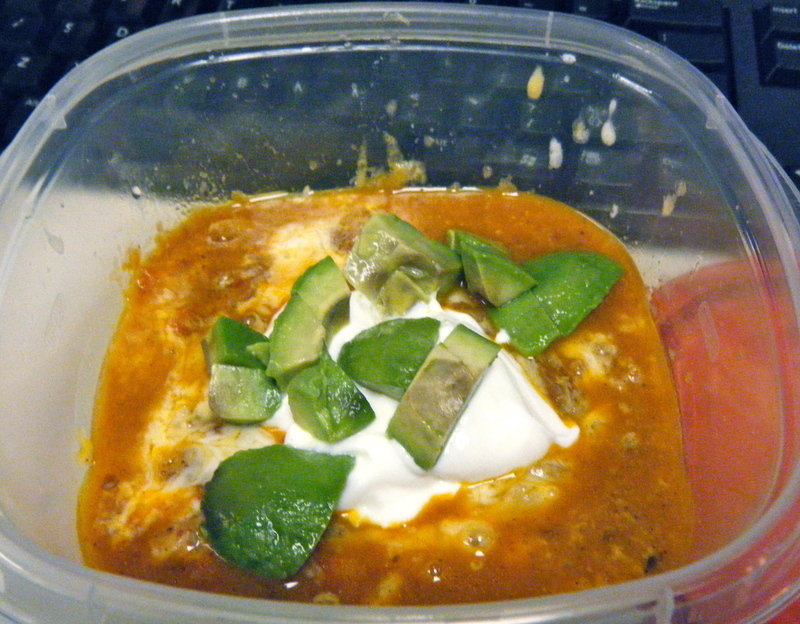 This time it was chicken chili with melted cheese, fat-free Greek yogurt, and avocado. It was a rainy day so a hot lunch was welcome. I’m still working on the chili recipe. I’ll post it once I feel it is blog-worthy. So nice I had to do it twice. 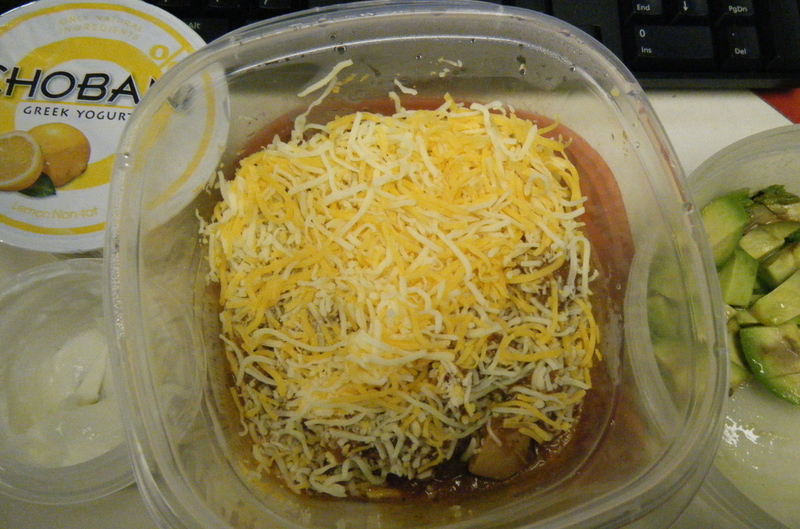 This time I took a picture before it went into the microwave. I brought some yogurt for an afternoon snack too. Grazing again. Look at that teeny round of brie. Trader Joe’s calls them Mini Brie Bites and they are my new favorite thing. 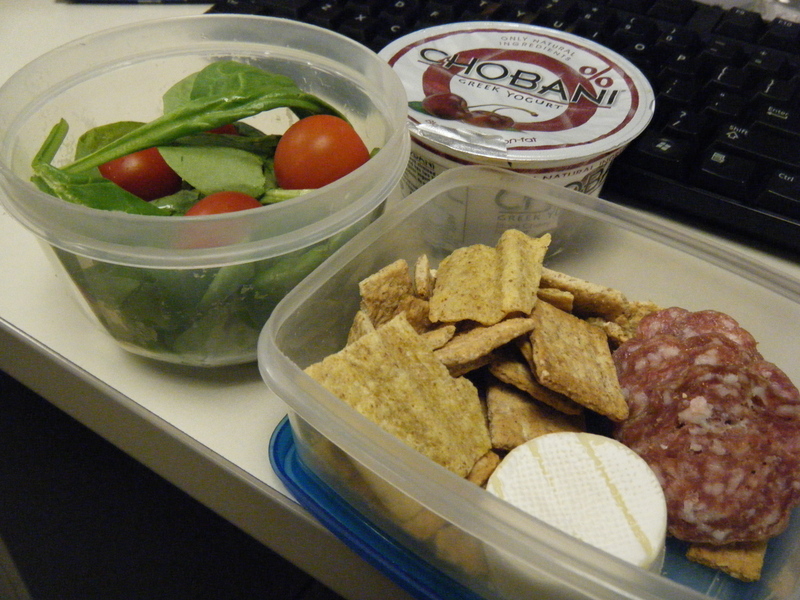 I also had sopressata, a small spinach salad, multi-grain chips, and yogurt. So far so I think I am doing well with this challenge. I think the hardest part (besides remembering to take a picture of my lunch every day) is coming up with new ideas. I admit that many of my lunches in the past were frozen entrées by Healthy Choice. So, dear blog reader, what do you like to pack for lunch? Leave a comment below. If I use your suggestion — I’ll give you a free…shout-out!